Dear reader, have you ever looked up? Have you taken the time to stop and contemplate our beautiful city, Strasbourg? I have no doubt about it, for if you are reading us here, it probably means that taking the time means something to you. But have you been you curious enough to discover the story hiding behind the oddities you meet? A name that echoes in the heads of all the inhabitants of Strasbourg. Everyone knows about that square, a key point of the tram network, but what is its origin and where does its name come from? After the bombings of the Second World War, Gustave Stoskopf, an architect born in Strasbourg (son of Charles-Gustave Stoskopf, one of the founders of the Alsatian theater) will get the chance to distinguish himself in Strasbourg. Known for being a specialist of concrete architecture and housing estates in the shape of vertical and hozirontal blocks, we owe him such estates as the Esplanade, the low-cost housing of the Belgians dock as well as the law school. And also, of course, some of the vertical volumes on the square of the Iron Man (French: “place de l’Homme de Fer”). We often get onto that square thanks to an iron (rail)way. On top of it move those big metallic boxes, that drop us off amidst an ironwork enclosure. Regarding iron, there is something here to wreak, no doubt about it. Is the origin of the square’s name to be found in here? Well no! It is clearly about a humanoid, who’d rather be more discreet. For that reason, he is not standing at the heart of the square, but on one of the bordering facades. He proudly sits atop a cross, neither of wood, nor of iron, but of glassy green! We are naturally talking about the eponymous drugstore. That’s it, you have finally met our local Tony Stark. Yet, our Strasbourgey Iron Man is much older. He has been perched up there for centuries! But why so? As is often the case, an idea – ingenious or ludicrous – will give birth to these names, places, characters and the like that we shall admire in our turn, and during our tours, years, decades, centuries later. Now, let us be a bit more specific on that very point. 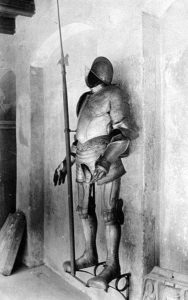 It was this watcher’s turn to guard the area in 1742 and, given he never failed with his duty for a duration no one would have endured (more than a century! ), the city of Strasbourg decided to grant him a proper retirement in a far less crowded place (too bad! ): the historical museum of Strasbourg. Now the new boarder is cared for by the staff there, where he enjoys a well deserved rest. But then, if he is not up there anymore, who is that knight I have seen recently? His respectable successor, Phoenix Ikki, knight of the Zodiac? No, it is of course a copy placed here for the sake of preserving the agonizing original. The copy, on duty since 1870, got the right to stretch its legs four times, the last time in 1985. The Iron Man (“l’Homme de Fer”, aka HdF), took the opportunity to go powder his nose and spend some time in a beauty salon, complete with a full wellness-detox-botox process. Indeed, despite his iron constitution, the bad weather and pollution finally wore him out. One love only and for ever… Happy Strasbourg!!! See also: Our Iron Man was even granted a poem and got on TV! 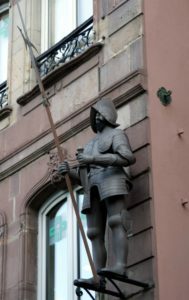 Matthias grew up in Hunchbacked Alsace, and came down from his hills to settle in Strasbourg for his studies, as many do. But Matthias is an eternal stroller, he contemplates, admires, and sometimes interprets; he takes his time and sees what many are missing. He is always as charmed as charming, who better than this stroller to take you around the city? He will have great pleasure to tell you about his beautiful city that he does not stop to walk and admire all day long. This Strasbourg guy at heart will share with joy and passion: tell the world he travels, the world around, us and especially his love for Strasbourg. So don’t hesitate anymore and follow the guide!